ONE person has died in a fiery crash on the Bruce Highway, south of Townsville. The crash at Guthalungra, 8km north of Bowen, shut the highway in both directions. Police confirmed a truck carrying pine timber and car collided head on about 5pm. The driver of the car has died at the scene, police confirmed. It is unknown if the car was carrying any passengers. The male driver of the truck was transported to the Ayr Hospital with minor injuries. It is understood the timber caught alight, causing metre-high flames. Due to the location of the crash, police were unable to redirect traffic. Motorists were being asked to avoid the area. A FIERY head on crash has closed the Bruce Highway in both directions south of Townsville. 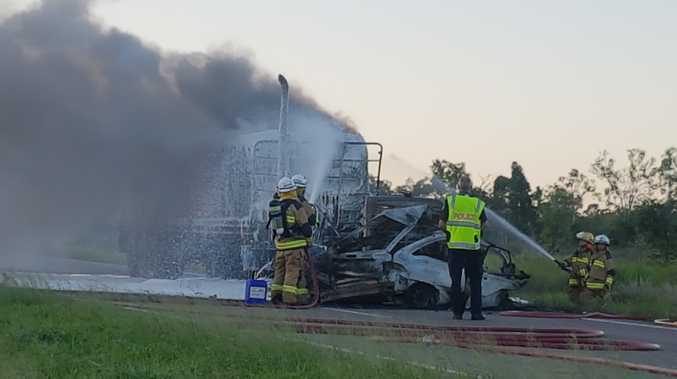 A Queensland Fire and Emergency Services spokeswoman confirmed crews were called to a head on crash between a car and a truck about 5pm. The crash occurred about 10km south of Guthalungra on the highway. Early indications are both vehicles have been engulfed in fire with witnesses reporting flames up to 50m high.